Creating a combat model for T. rex versus Edmontosaurus regalis. A T. rex (Bob) is attacking an Edmontosaurus (Julie) while its companions (Gertie & Muffie) flee (screen capture of the AI test bed program). Click to enlarge. We are at the point in the development of the AI routines for the inhabitants of Dinosaur Island where it is time to make decisions about the combat models used to determine the resolution of hostile encounters. 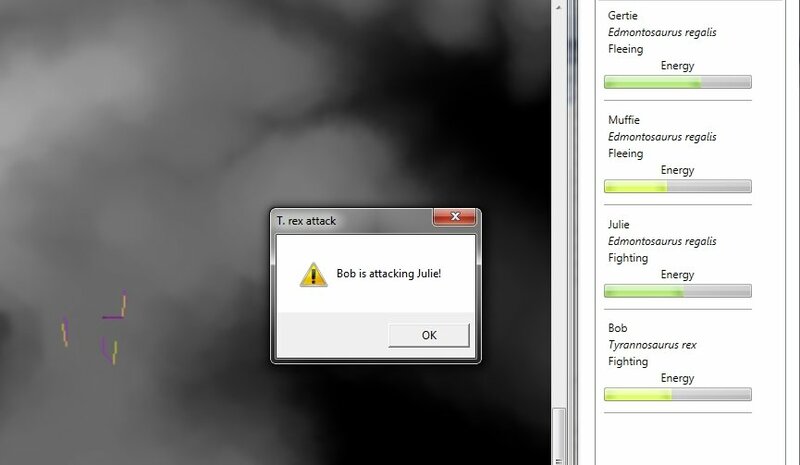 As shown in the screen capture of the Dinosaur Island AI testbed program (above), the simulation is placing the dinosaurs in various appropriate states such as: resting, eating, looking for food, looking for water, stalking prey, moving towards water, moving towards food, drinking, fighting and fleeing. My first thought on the subject of modeling combat between T. rex and Edmontosaurus regalis, the first two resident species on the island, was that it would be handled similar to ‘melee combat’ models that I had previously used for my wargames. 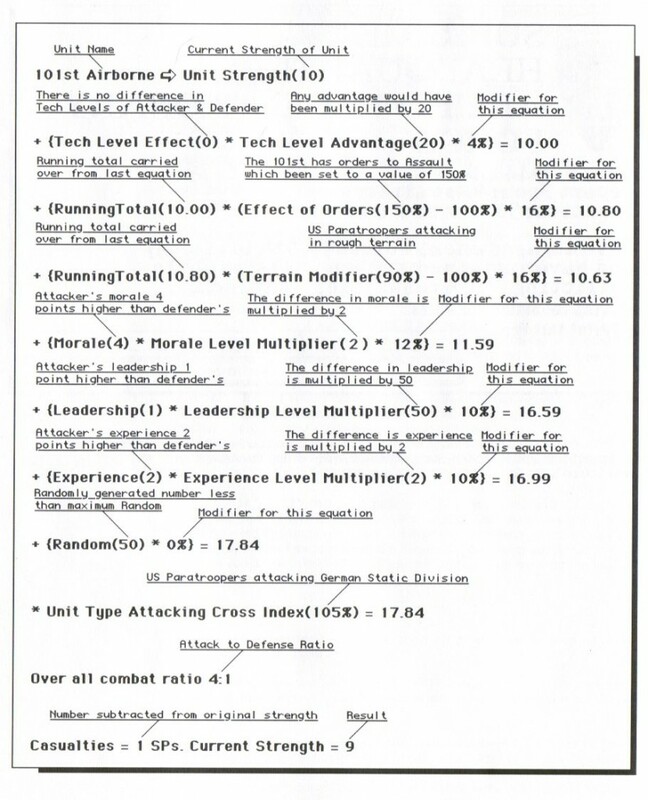 Below is a page from the manual for UMS II: Nations at War explaining the 20 variable equation used to decide combat between tactical units. The 20 variable equation used to calculate combat in our UMS II: Nations at War (1989). Scan from user’s manual. Click to enlarge. I was envisioning something similar for Dinosaur Island until I happened to see this video (below) which includes a sequence (starting at 4:45) describing hypothetical Edmontosaurus and T. rex combat. The tail of an adult ‘bull’ Edmontosaurus regalis was a formidable weapon. T. rex, like many predators, would have preferred to attack adolescent or sick animals rather than encounter a full-size, and potentially lethal, ‘bull’. The correct pronunciation is Ed-MONT-o-saur-us. I’ve been saying it wrong for the last six months! Sometimes T. rex did attack a living Edmontosaurus. Sometimes the Edmontosaurus survived the attack. Furthermore, we know that some T. rex had suffered bone injuries during their lifetime (“An injury to the right shoulder region of Sue resulted in a damaged shoulder blade, a torn tendon in the right arm, and three broken ribs. This damage subsequently healed (though one rib healed into two separate pieces), indicating Sue survived the incident.” – Wikipedia) consistent with the type of damage that a 5 meter long tail (described as being “like a baseball bat,” in the above, video) could inflict. In other words, combat between T. rex and Edmontosaurus regalis was not a foregone conclusion. Indeed, it was entirely possible that the Edmontosaurus could walk away unscathed while the T. rex could suffer some broken bones. The AI for Dinosaur Island will reflect this. When deciding if the T. rex will attack the AI will have to analyze the T. rex‘s chances of victory and potential injuries (risk versus reward) considering the size of the T. rex, the age of the T. rex, the health of the T. rex, the size of the prey, the age of the prey and the health of the prey. And, when the two dinosaurs actually engage in combat the tactics employed by both will probably decide the outcome. If the T. rex can sneak up on the Edmontosaurus until they are within 50 meters or less and then close the distance with a rush the advantage would certainly lie with the predator. If the Edmontosaurus has forewarning of the impending attack it would either attempt to flee or stand its ground and assume a defensive posture. 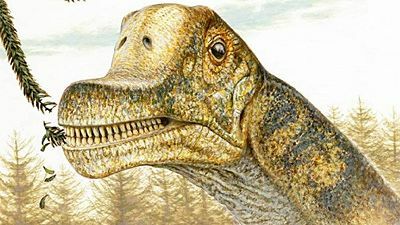 There is reason to believe that both Edmontosaurus and T. rex had well developed olfactory bulbs in their brains and smell was an important sense for both animals. We will add wind (and wind direction) to Dinosaur Island and incorporate this into the AI routines that control the dinosaurs. Predators will attempt to get ‘upwind’ of their prey; prey animals will ‘sniff’ the wind and respond if they smell a T. rex even if they can’t see it (see “Dinosaurs, tanks and line of sight algorithms” here). For the last week I have been busy researching the details of the food chain of the first inhabitants on Dinosaur Island: Tyrannosaurus rex, Edmontosaurus regalis, Nipa and Araucaria. The papers that I have been reading are: “Could Tyrannosaurus rex have been a scavenger rather than a predator? An energetics approach,” Ruxton and Houston, The Royal Society, February 2003; “Giants on the landscape: modeling the abundance of megaherbivorous dinosaurs of the Morrison Foundation (Late Jurassic, western USA),” Farlow, Caroian and Foster, Historical Biology, Vol. 22, No. 4, December 2013, pp. 403-429 and “Sauropod Feeding and Digestive Physiology“, Hummel and Clauss, Biology of the Sauropod Dinosaurs”, Indiana University Press, 2011 pp. 11-33. The T. rex, Edmontosaurus regalis, Nipa and Araucaria food chain. How much energy does the Edmontosaurus receive from eating one Nipa plant? How much energy does the T. rex receive from eating one Edmontosaurus? What we are trying to ascertain is exactly how much energy is transferred each step of the way. How much energy does the Edmontosaurus receive from eating one Nipa plant? How much energy does the T. rex receive from eating one Edmontosaurus? For example, in Sauropod Feeding and Digestive Physiology we learn that Araucariaceae is estimated by one source to produce 7.0 Mega Joules per kilogram of dry matter but by another source as between 6.3 and 10.8 Mega Joule per kilogram of dry matter. In Giants on the landscape: modeling the abundance of megaherbivorous dinosaurs of the Morrison Foundation one model is that the estimated energy consumption for a megaherbivore is 55 kilo Joules over kilograms of body mass0.75 per day and another model is for 550 kilo Joules over kilograms of body mass0.75 per day. In Was Tyrannosaurus rex a scavenger? there are also estimates for the energy produced per kilogram of carrion and the amount of energy needed by T. rex if it was a scavenger (slow moving) or a hunter (very fast moving). As I’ve said before: I’m a computer scientist, not a paleontologist and right now I feel like I’m back in grad school just trying to keep up with my first year classes. However, I have no doubt that Dinosaur Island will be a very useful tool for answering some of the questions raised in these papers.